Visit the Upcoming Events page to see more ways to get involved! UPDATE: Unfortunately, Keith didn’t win, but we are thrilled to report that ALL Oregon DNC members voted for Keith Ellison for DNC Chair! Thanks to everyone who contacted them! 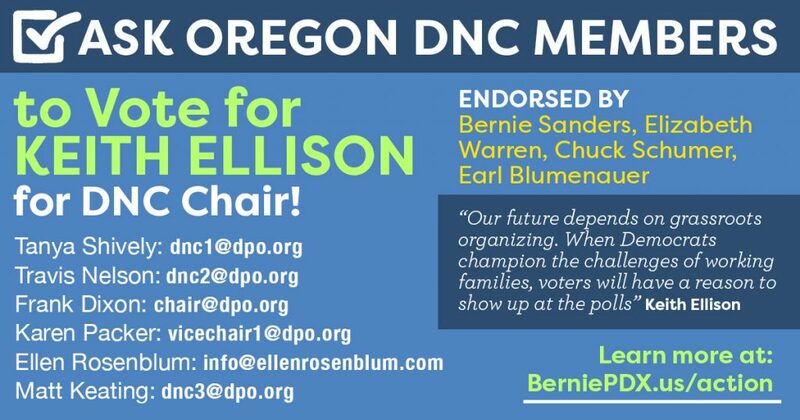 TAKE ACTION: Ask Oregon DNC Members to Vote for KEITH ELLISON for DNC Chair! Click Here to download this graphic to share on social media! Keith is endorsed by: Bernie Sanders, Elizabeth Warren, Chuck Schumer, Earl Blumenauer, and Harry Reid. The last day to be heard is February 23! I’m writing to ask you to vote for Keith Ellison for DNC Chair. Since 2008, Democrats have lost over 900 legislative seats. Republicans now control the White House, Congress, 33 governors’ offices, and almost 70% of partisan state legislatures. Keith Ellison has won 17 elections. He knows that taking back the country requires reaching out to working class voters. Keith embraces grassroots involvement, and understands that the Democratic Party’s strength is in the people. He’s the only person running for DNC Chair who can unify the progressive and moderate elements within the party. Can Oregonians count on your vote for Keith?